Writer and Top Cow President/COO Matt Hawkins (THINK TANK, SYMMETRY) teams up with writer Bryan Hill (POSTAL, ROMULUS) and artist Yuki Saeki (GameSpace, Crash) for the grittily realistic science fiction graphic novel GOLGOTHA this October. In the near future, a group of scientists and military operatives are sent on an interplanetary mission to develop Earth's first off-world colony. While the crew of the Golgotha hibernates for travel, technology on Earth continues to advance—so much so that when they land on the planet, the crew finds it already inhabited...by another team from Earth that arrived years before they have. Now the crew of the Golgotha find themselves relics of their own time, unwanted by the colony that's been expecting them for a generation. And this new planet holds its own secrets—secrets that could change the nature of humankind itself. A 20-page preview of GOLGOTHA is available here. GOLGOTHA (Diamond code: AUG170552, ISBN: 978-1-5343-0320-1) arrives in comic book stores Wednesday, October 25th and bookstores Tuesday, October 31st. The final order cutoff deadline for comics retailers is Monday, September 25th. 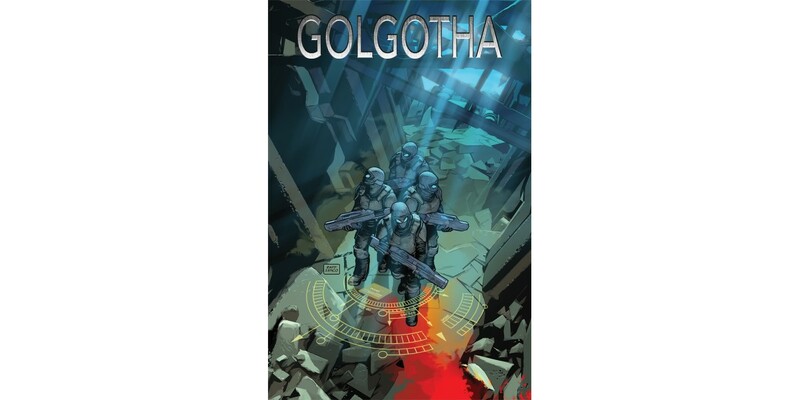 GOLGOTHA is available for preorder via Amazon, Barnes & Noble, Indiebound, and Indigo.